ALLISON PARK HISTORY– NAME ORIGINS– FAMOUS OTHERS– CONCLUSION–MAP & DIRECTIONS, ETC. Anyone who has driven among the hills of North Pittsburgh has seen the road signs for Allison Park. The positive impression one gets from actually driving through the community is that of age and affluence. In other words, most of the homes and businesses have been there awhile but the occupants of this early bedroom community lead comfortable lifestyles. The farm and homestead for whom this part of Hampton Township is named belonged to my great great great-grandparents, George and Susannah McRoberts Allison. Much of the basic genealogical information in this article was made available by a distant cousin Betsy Hare Kemp, and we credit her here, but research is ongoing and in the future we want to explore census records and land warrants. In the following story we’ll consider the origin of the Allison name, relate news of the recent celebration honoring 350 years of the Allison family in American, and look at other, perhaps more famous Allisons. At the same time we present several intriguing mysteries: First, is there any connection between the earliest Maryland Allisons, of English stock, some of whom can be found settling with our Western Pa Scots-Irish Allisons who had moved up from the Cumberland Valley; and second, are we related to U.S. President William McKinley, who traveled regularly through Western Pennsylvania on his way from his home in Ohio to the White House? In another article, “More research on our George Allison Family,” we raise the question of a connection between the eastern Pennsylvania Allisons and our state’s only president, James Buchanan. But for now, come along with us as we drive north along Route 8, the old Plank Road or Butler Pike as it was called long ago, that stretches along Pine Creek from the river town of Etna in Allegheny County the entire way to Lake Erie. Just north of Allison Park is the venerable Pennsylvania Turnpike and to the northwest are the public lands of North Park, some of which were formerly owned by our more immediate families: Pearces and Nelsons, in-laws of the Allisons. According to the 1889 History of Allegheny County in a posting on Genealogy.com by Cathy Farrell, “The Allison family was among the pioneer settlers of Allegheny County, Pennsylvania, and bravely endured the hardships which the early settlers were called upon to endure. They have proved their worth as good citizens and patriots in many cases” (380). 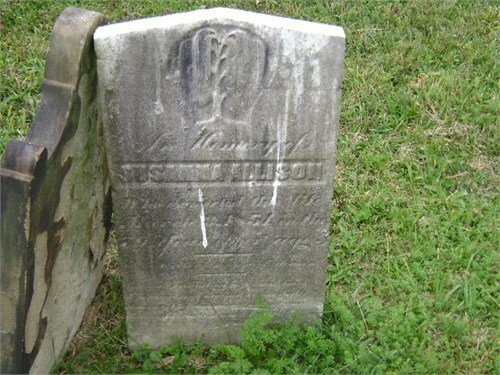 Let’s begin with George Allison, Sr. (1775-1839). We know very little about his origins. 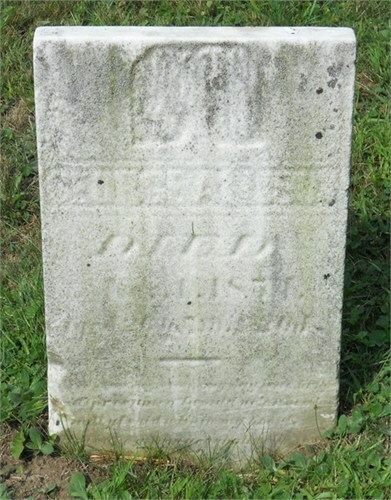 Betsy Hare Kemp tells us that he died in Pine Township, and below is his tombstone from the old Pine Creek Cemetery. George’s wife, Susannah (1775-1854), may have had family buried in Pittsburgh’s South Hills near McRoberts Road, but she too is buried at Pine Creek. The Pittsburgh Post-Gazette, in a story about the origins of Allison Park, reports that George had emigrated from Ireland to settle in Chester County, PA. Other sources suggest that the “Chester” referred to may have been in Maryland, in which case he may have been part of the English Allanson/Allison family referred to below. There’s also more about them in the research article mentioned earlier. We know that he and wife Susannah had seven children, at least one of whom was born in Pennsylvania’s Cumberland Valley near present day Harrisburg. These Allisons moved to the Pittsburgh frontier in 1810 where George farmed 200 acres in what is now Hampton Township, part of the Depreciation lands that were offered to soldiers of the American Revolution as partial payment for their services and were later split up, auctioned to the highest bidder, or sold on the free market. We also know that George served in the War of 1812, although the details are few. There’s no reason to believe that the George Allison listed as a merchant in the 1815 Pittsburgh City Directory isn’t our own, even if the store was perhaps a simple produce market. Furthermore, as a prosperous landowner, our George is undoubtedly the one included in historical records as a board member of the city’s first commercial bank. His son, George, Jr., remained at home to run the farm, which probably allowed George, Sr. to pursue other interests. This was a family of great ambition, good fortune, and prestige in the community. Rev. Archibald Alison (1757-1839)—A fellow of the Royal Societies of London and Edinburgh, he published Essays on the Nature and principles of Taste. Sir Archibald Alison (1792- ? )—The son of the above was a lawyer, author, and historian whose mother had directly descended from King Edward I of England and Robert the Bruce of Scotland. Dr. William Pulteney Alison (d. 1859)—The brother of Archibald, Jr. was professor of medicine and physician to the Queen. Thomas Allanson/Allison (1639-1684)—The Lord and Earl of Christian Temple Manor established Charles County, Maryland, in 1658 through the hand of and grant from Lord Baltimore. The 350th anniversary was celebrated in 2008 with a documentary film, commemorative book, and installment on the TV series Family Reunions. We will look more at this family in our “Research” article. John Allison—The owner of the Allison Park in Maryland was the great-grandson of English immigrant Thomas Allison. Abner Allison (1769-1827)—He is the supposed grandfather of U.S. President William McKinley. One may follow this controversy by Googling either “McKinley ancestry” or family researcher, the late “Thomas B. Gotham.” More about this in our “Research” article. Rev. Dr. James A. Allison, Jr. (1823-1866)—This relative was the grandson of George and Susannah and son of James, Sr. and Elizabeth Brickell Allison, who are buried with our Pearce family at the Crossroads Presbyterian Cemetery, Pine Township. James, Sr. was a farmer and tanner in what is now Richland Township. Dr. James’ mother’s family, the Brickells, farmed near Pittsburgh as early as 1760. Dr. Allison studied at what is now Washington & Jefferson College and Pittsburgh Theological Seminary before pastoring at the Sewickley Presbyterian Church for sixteen years. In 1864, he and the Rev. Robert Patterson, pastor of the Hiland Presbyterian Church and president of what is now the University of Pittsburgh, purchased and published the national magazine, the Presbyterian Banner, which is still read around the world. Whether of Scots-Irish or English origin, the name “James” continues to be extremely popular. Whether as a surname or a first name, it’s no doubt a reference back to the line of kings of the British Isles, starting with six in Scotland and culminating with the most notable and noble of all, James I of England (a.k.a. James VI of Scotland), planter of settlements in Ireland and America, commissioner of the still popular Bible translation, and target of many arguable royal tales. In questioning the connection between our George (the given name of another long line of British royalty) Allison, probably Pennsylvania Scots-Irish, and the Maryland English Allanson/Allisons, I discovered many Allisons named James, and not just one with high American military rank, but at least two. Read more in the Allison “Research” article. From names of places to given and surnames of people, from hurricanes to song titles, Wikipedia offers more interesting reading when you search “Allison.” As for the mystery concerning the connection between the earliest Allisons in America, the Maryland branch, and ours from the Allison Park area of Pittsburgh, contemporary researcher/namesake George Allison says on GenForum: “The tri-state area of OH, PA, and WV [has] become the ‘Holy Lands’ of the Allison family. This area is loaded with family heritage and history, with many discoveries left to be found.” He believes the Maryland branch, through the sons of Lord Thomas and Barbara Allison, migrated across the U.S. as follows: southern regions, Benjamin; and interior states, Richard. However, he holds that it was descendant Charles Allison’s sons Charles, Jr., James, and Samuel that settled in Western PA and Northern WV, just across the Allegheny Mountains, in the late 1700’s and early 1800’s. But, at this point, there is no solid connection between those English and our Scots-Irish families that we are aware of. That’s OK because, aside from having a prosperous and thriving community in Western Pennsylvania, Allison Park, that we know for certain was named after our family, we also have hundreds of years of other positive and probable surname associations in this country and Europe to point to. This initial Allison investigation has led to some wonderful discoveries, and we hope future field trips and internet research will reveal more family narratives that we can share with all the descendants. Hi: Let me first introduce myself. I am a member of the family which keeps on growing, decended from Sir Archibald Alison. please feel free to contact me for details from our family historian. We are currently involved in writing our family tree and reuniting the family with some sucsess. Anything you can tell me about our George Allison, born in 1775, I would appreciate. There has always been a question of where he first settled in America, Maryland or Pennsylvania, before establishing the community of Allison Park, near Pittsburgh. Thank you so much for reading my web page, especially the Allison Family Tree with Table of Contents: http://e-gen.info/?page_id=66.